I'm not part of the BioShock backlash. I think that's a spectacularly uninteresting place to be. What I find interesting about the reaction to BioShock is that everyone who likes the game is so secure in their appreciation of it that they have no trouble admitting its flaws. There's no hyper-defensive fan contingent denying that major problems with the game exist. And indeed they do. Here are three of them. 1. No! No! No, no! I don't like to throw around this word but the choice whether to harvest or rescue the little sisters is broken. It's hard to understand why this is the case because it's such a fundamentally simple and classic philosophical debate. You can make the rational, self-interested choice to gain as much resources as you can from this one interaction. Or you can sacrifice/minimise your short-term reward in favour of long-term benefit. This is how it's presented to you and it's basic political philosophy. It's realism versus idealism. You'll get less Adam for rescuing the little sisters but there's the promise of a greater reward down the line. That could be the "good" ending. Or it could be the difference whether the little sisters or Tenenbaum help you with Fontaine or not. What it can't be is what it is. "Long-term benefit" does not mean frequent gifts that not only make up your Adam deficit but also give you the supremely powerful "Hypnotize Big Daddy" plasmid which you can't get otherwise. The whole dichotomy is useless now. No sacrifice is made with the liberal option and there is no rational, objective reason to harvest the little sisters. The fundamentally irrational choice almost immediately becomes more rational than the rational choice. It's an absurd situation. Choosing whether or not to kill Sander Cohen is a more interesting dilemma and the game spends no time on that one. I think everyone killed him though. I didn't. After the magnificent Andrew Ryan scene, BioShock slips. It's partly because, in a sense, that scene was the end of the story. 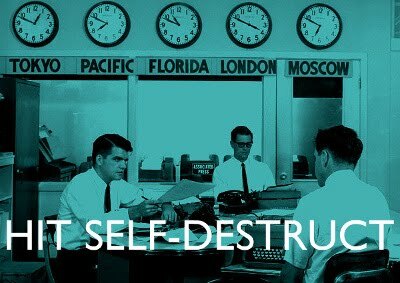 It's the end of a story about objectivism and self-interest but, less theoretically, it's the end of a story about freedom of choice. We've been under Atlas's spell the whole game but now, after we bust free of his mind control, what's any different? Now we're doing what Tenenbaum tells us to do. This would be fine if the game appeared more aware of this irony. But post-Ryan we don't hear anything more about men versus slaves or anything about the player character at all other than "I hope you won't hurt the girls." That one scene embodied all the grandiose and fully attainable pretensions the game had and from that point on, it's all rather more straightforward. Unfortunately, BioShock failed to deliver on the implications made explicit in that scene and in the game prior. There's an argument to make for this. Ken Levine's point is about the general lack of player agency in video games, but covering himself with the mind control element to legitimise it within the game's fiction. And in Ryan's ideology you don't need to be brainwashed to be a slave. It makes sense that the player is still ultimately a slave, because that's the point Levine's made. But without the mind control device it isn't legitimate anymore. There's an argument there. But the game doesn't make it. After the Ryan scene BioShock shows no interest in engaging the player in a dialogue on this subject. The scene becomes a neat reveal and an incisive piece of meta-gaming commentary instead of the cornerstone of a greater game. During that Ryan scene we all assumed BioShock was about to become that game. After Ryan, the game is about different things. 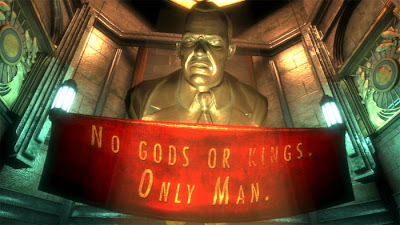 As of the endgame, BioShock is more a story about Little Sisters and uncomplicated avarice than objectivism or philosophy. Fontaine's final form is a nod to what the game used to be about but that's it. The (good) ending is a great conclusion for the little sisters and for your character (apart from it projecting desires onto the player character for the first time: wrong game to do this in)... but it's not a good conclusion for BioShock. What's neglected in this ending? This whole city and everything it represents! A microcosm of society, chaos and order, objectivism and nihilism, and, oh yeah, a massive art deco city under the sea! 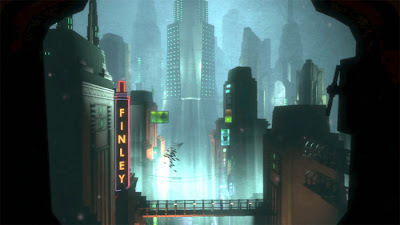 Neglecting Rapture here really puts a point how BioShock fails to realise the city throughout. Rapture is a great setting for a shooter: great architecture decorated with enemies and ammo machines and audio diaries. I don't believe that anyone ever lived here, and not for lack of trying on my part. That's why I was ultimately content to waste so much time dicking around in the service of Sander Cohen, because it was an intriguing new facet of Rapture. BioShock opened presenting you with this amazing location and I wanted to know what about it. More than that I wanted to know what happens to it. 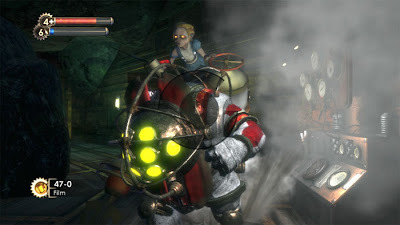 We don't find out, but not in a "BioShock 2!" way. We don't find out in a "you were a good/bad person, the end." way. The end admits that Rapture wasn't important. It was an illusion. So what was BioShock really about? I honestly don't know. Killing little girls for their stuff is not obectivism!